In this post, Cats Protection’s Behaviour Manager Nicky Trevorrow explains the importance of kitten socialisation. Did you know it is important to socialise your kitten? Cat behaviour is influenced by both nature and nurture, including everything from genetics through to specific learning experiences. Because of this, preparing a kitten to cope with the challenges they will face throughout their life is vital, and has one of the most important impacts on their lifelong welfare. The socialisation period is identified as between two to seven weeks of age. During this period, kittens learn what aspects of the environment are ‘normal’ and ‘safe.’ Equally, when they’re an adult they are likely to be scared of anything they didn’t come across during this period. Cats do not have an inbuilt need to be with people, so this is usually a learnt behaviour. 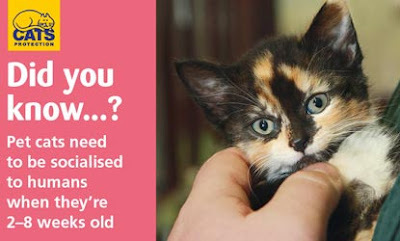 Early handling by a variety of different people during this time is essential in order to socialise kittens with humans. At Cats Protection, we use a structured kitten socialisation programme developed by Dr Rachel Casey, helping kittens get used to various experiences to adapt to life in the home environment. Before handling the kittens, it is worth spending time with the queen or mother cat, to ensure she is familiar with the person through positive associations of gentle interaction. It is important to ensure that experiences and interactions are positive for each individual kitten. Time spent handling each kitten can be gradually increased over successive weeks, and should ideally be carried out by a minimum of four people including men, women, children and older people. Studies show as little as 40 minutes handling a day during this period has a profound effect on the friendliness of kitten and their willingness to approach people. In addition to holding the kittens, gently performing health checks such as examining sensitive areas like the ears, feet and tail will prove invaluable later in life when the cat visits the vet. If you’re looking for a kitten, adopt with confidence from Cats Protection. We have thousands of kittens across the UK each year, all looking for new homes. For more information on how to care for your kitten, take a look at our online essential guide.